Imagine packing a school lunch for your child. Simple enough, right? You go to the store, buy the food, pack the lunch and off they go. But for the one in 13 children with food allergies, life isn’t so simple for them or their families. Navigating grocery store aisles is a daunting task filled with endless label reading and feeling limited on options. And for those people who have children with nut allergies, you can forget going anywhere near the peanut butter aisle. While it can’t be considered good news that the rise in food allergies in the U.S. has reached epidemic proportions, according to the Center for Disease Control, the result of this is the fact that there are more free-from options available than ever before (free-from: allergy-friendly foods often free-from the top eight food allergens, identified as wheat, dairy, peanuts, tree nuts, egg, soy, fish and shellfish). These options allow you to safely pack your kid’s lunch, while allowing other families without food allergies to do the same so every child can attend school without worry of an anaphylactic reaction. Just this year, the Blue Cross Blue Shield Association released findings that the number of kids treated in emergency rooms for anaphylaxis spiked 150 percent from 2010-2016. That’s not an easy statistic to swallow. It’s easy to feel different and excluded when living with food allergies. Just ask the 100 million Americans living with and/or shopping for allergy friendly and gluten free foods. That’s why we at Enjoy Life Foods, want to celebrate our unique differences this Food Allergy Awareness Week (May 13-19) and give everyone the opportunity to eat freely all year long! So what does eating freely mean? It means being able to indulge in a bag of chocolate (Enjoy Life Baking Chocolate, we hope!) and scarfing down a bag of chips – without worry. It’s the motivation we use to bring our loyal community delicious free-from options that are safe for you and your families. We have an ever-expanding portfolio of 70+ allergy friendly foods ranging from baking chocolates to cookies, snack bars, protein bites, seed and fruit mixes, and more. All are free-from 14 allergens, including wheat, peanuts, tree nuts, dairy, casein, soy, egg, sesame, sulfites, lupin, mustard, fish, shellfish, and crustaceans. And because we know people want to eat beyond the bag, we enlist the list help of chefs to create everyday allergy friendly recipes. Last year alone we created a whopping 73 new recipes, including Brownie Bottom Pumpkin Bars, Banana Bread, and Cream Eggless Cookie Sandwiches. That’s 73 ways for you to enjoy eating freely every day! To make eating freely easy, look for our vibrant teal packaging on grocery store shelves. Our colorful new look is a nod to our core food allergy community and makes our products easier to spot across every aisle. We even included a bright yellow flag in the upper right corner that serves as an easy reference for product certifications so you can eat freely knowing our foods are made with care. 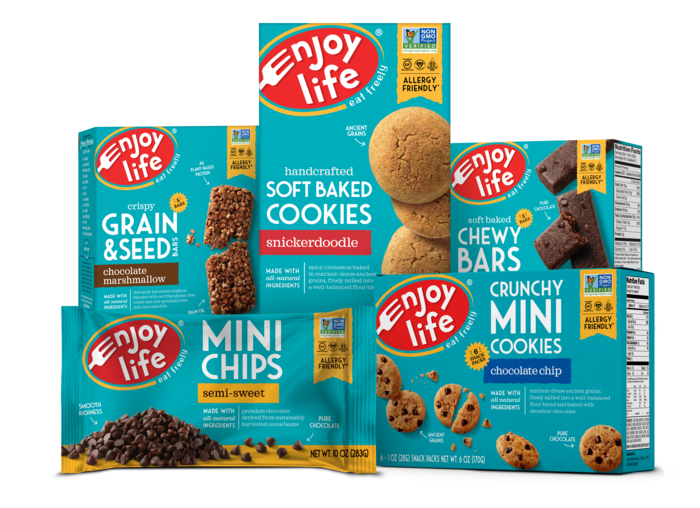 So go ahead, grab a cookie, and join us at Enjoy Life in eating freely this Food Allergy Awareness Week. We hope that worry-free cookie gives you a bit of happiness, normalcy and sweetness you deserve!